When setting up your yard storage, why settle for a shed that will require your regular attention to maintain? 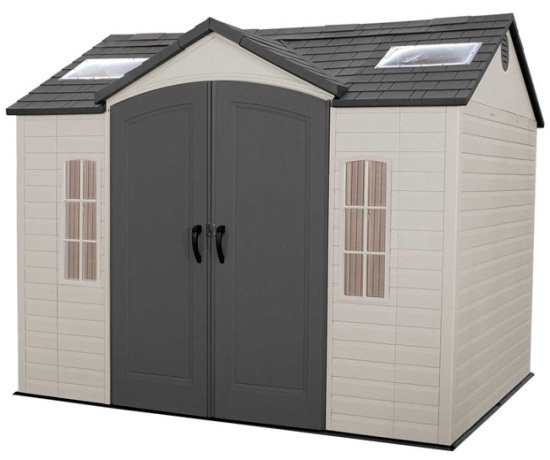 The Lifetime 60005 garden shed features a maintenance-free design. 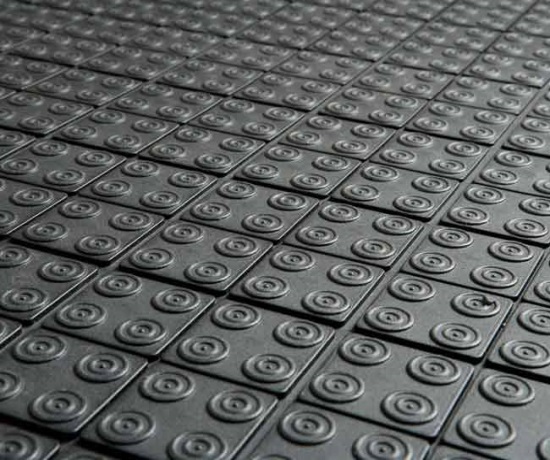 The walls, roof, and floors are made with high-density polyethylene (HDPE) plastic. HDPE will not fade, crack, or peel. No need to repaint. This shed will continue to look great for years to come. 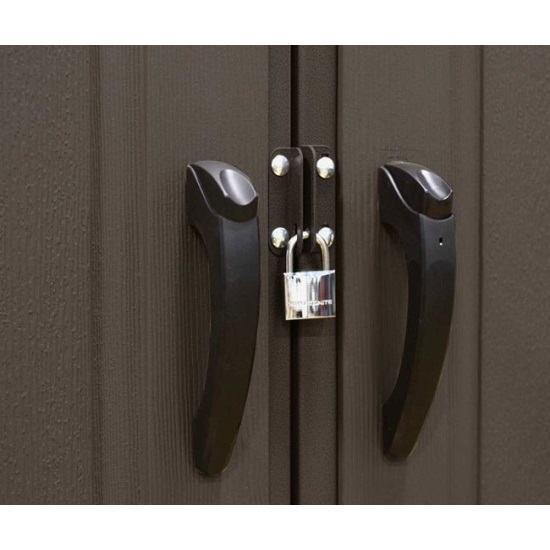 With an internal latch and exterior padlock loop, the doors of this shed can be secured to protect the contents in your shed. 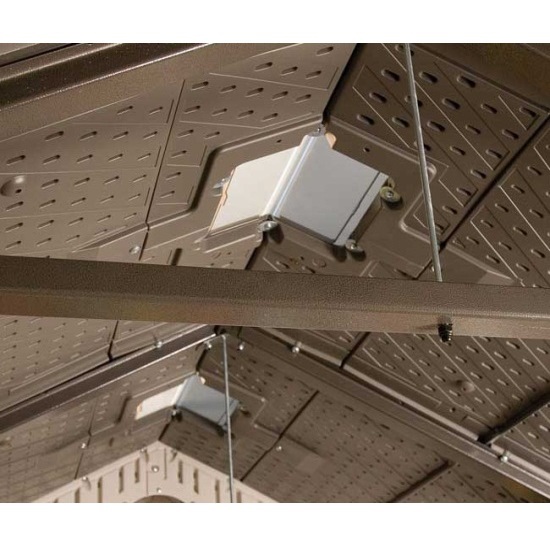 Steel reinforcements provide the roof and walls with superior strength. The snow load capacity of the roof measure a sturdy 23 lbs. per square foot. Store your yard equipment right with a Lifetime garden shed. This shed comes with a 10-year factory warranty from Lifetime Products. What use is a Lifetime Garden Shed good for? Garden Sheds have a different layout than the typical Lifetime storage shed. Garden sheds have the entrance on the length side, which is the extendable side, instead of on the width side. This allows you to access the shed from the center instead of the end of the shed. 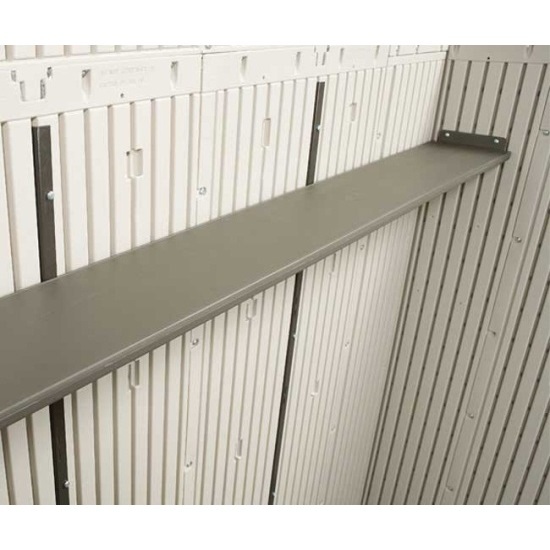 This layout makes parts of the shed more accessible depending on how you want to store your products. Typical uses for this shed would be storing gardening supplies and boxes because all of those things can be stored up against the walls on all sides of the shed. If you need to store a motorized device, such as an ATV, you would do better to stick with a regular Lifetime shed. This particular shed has all the steel reinforcements within the walls. The roof trusses are all steel as well making this a great shed in areas with heavy snowfall. Check your local building codes and city ordinances before ordering. Some cities might require a building permit. Lifetime garden sheds will require some sort of support structure under the shed. A wood framework or a cement slab is typically used. 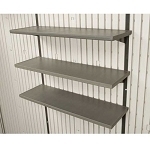 Includes 2 90x9 inch shelves, 2 9.5 inch radius corner shelves, and 1 16 inch tool peg strips with hooks. Includes 2 dome skylights to allow ample natural light into the shed. 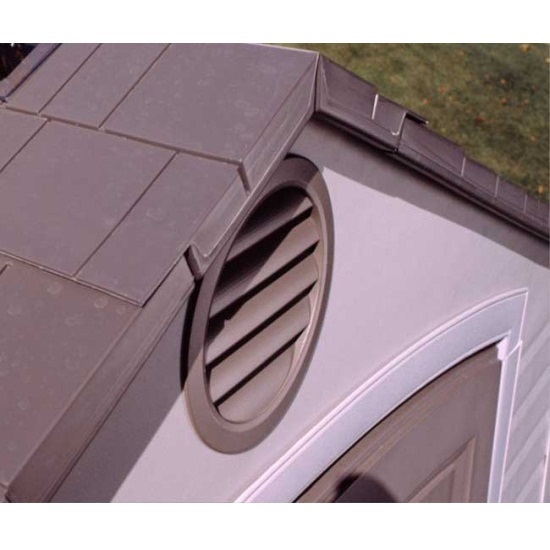 Includes 2 screened vents to help ventilate to the inside of the shed. 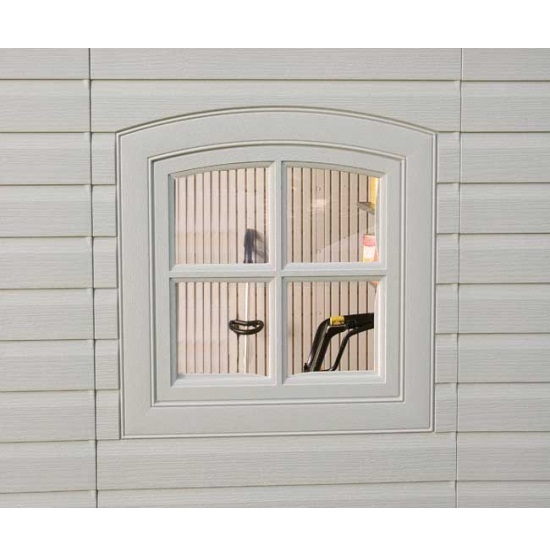 Includes 2 stationary windows (do not open) and 1 opening window. Nominal Dimensions: 10 Ft x 8 Ft. Window Opening Dimensions: 17 inches x 17 inches. Interior Height Minimum: 71 inches. Interior Height Maximum: 95 inches. Square Feet: 71.25 square feet. Cubic Feet: 494.5 cubic feet. 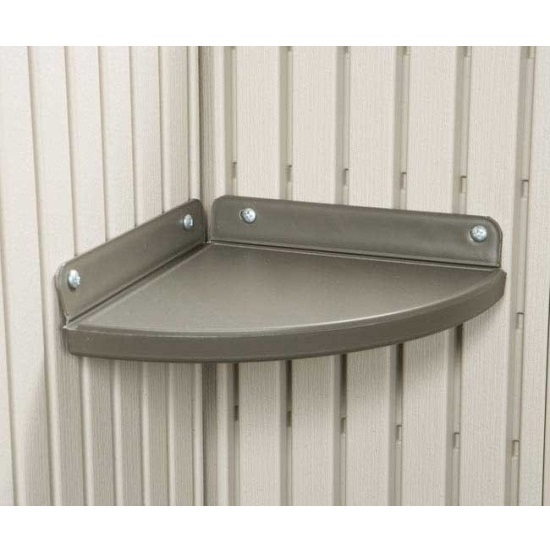 Wall support weight capacity: 50 lbs. A great building at a great price!!! Setup was a breeze. I could not have built a wood shed this good looking for anywhere near the price. It took me less than 7 hours to put this together all by myself. The sky lights and windows are great. The shed is very sturdy and came with plenty of hardware. I am impressed with it. Very solid build. Door latch works well, shelves are strong. I like it very much. Except for the floor. While standing on a step ladder putting the roof together, the legs left impressions and even damaged the plastic floor. I do not expect to have any further issues unless I park a motorcycle in there. It is fine for bikes and lawnmower but anything bigger than a small dirt bike will cause damage to the floor. Beautiful shed!!! Fairly EASY to put together. If you do the prep work (Laying out ALL pieces that belong together, attaching skylights to roof panels, putting the trusses together, etc.) before starting to assemble, it will go MUCH faster. I would estimate about 10 hours total time. Instructions were the BEST I have EVER seen! I am 61 years old and the ENGINEER that helped me (I helped him) is OVER 70! Should have done this two years ago! This garden shed is great! This company is great! I ordered, less than a week, it arrived. My partner and I built it in a weekend (ground prep to platform to padlocking the doors)in about 12 hours total. Easy. The doors are very wide and taller than one would think. The instructions are very clear. Its not to be over thought and the directions read (over and over) do not over tighten. The shelves add rigidity to the walls which is a bonus because two come with the kit. This garden shed is adorable and functional with a practical design and construct. Someone knew what they were doing, they shared it with us, and made it simple to do ourselves. Thank You. Shed came exactly when they said it would. I put it together with my 14 year old daughter over a couple of days, took us about 6-7 hours total. Went together without a hitch and no problems with the directions even though there are 70 pages for the install. Haven't put anything in it yet but very happy with the ease of the install and the look of the shed! Q: What is the actual color of this shed? 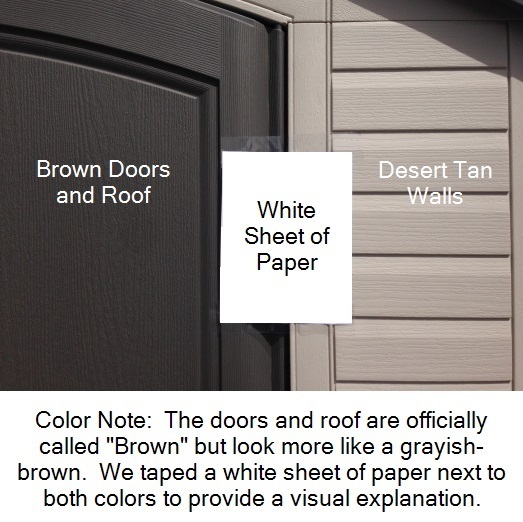 A: The doors and roof are officially called "Brown" but look more like a grayish brown. The walls are desert tan. Q: Does this come in gray? A: This is the only color currently available. Q: Does the 30" extension kit 6422 work with 60005 10X8 garden shed? A: The 6442 extension kit Fits Lifetime 5' long and longer 8' wide Outdoor Storage Sheds that do not have a full-length ridge skylight. 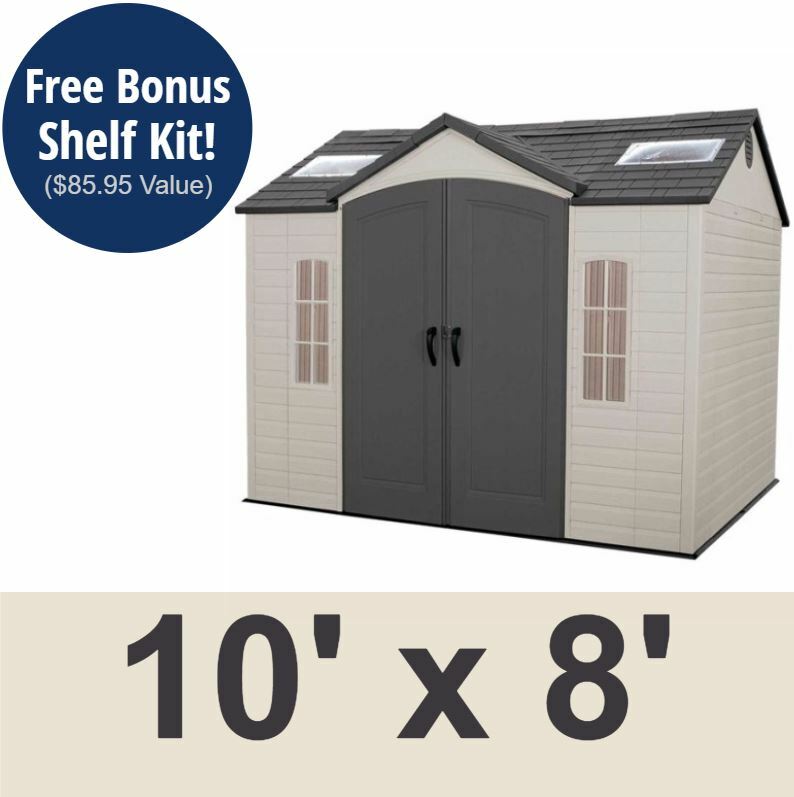 This extension kit can be added multiple times, but extending a shed too far may void the warranty. Also, you may wish to buy two for side door sheds, in order to keep you shed symmetrical. This shed is compatible. Q: Do the doors open up fully? Flat against the sides? A: The doors do not open so far that they will touch the sides. They open out about 110 degrees from the door opening. Q: Can I take shelves out if I do not want them? A: Yes, all of the included shelves can be removed, or not installed if necessary. Q: Will the shed be already built when delivered? Will they place the shed in the exact location? Is it curbside delivery? A: No, the shed comes in a box and requires assembly. This shed ships on a semi trailer and the shipping company will call you in advance to schedule an appointment for delivery. You will want to have someone there to carry it to the desired location, it will usually take just 2 people. Q: where is this item shipped from as we are in the Barrie area. Where is this item shipped from as we are in the Barrie area ? A: This ships just north from Salt Lake City, Utah. These items usually leave here the next business day. Shipping to your location can take about a week to ten days to arrive. Often it arrives sooner, but we cannot guarantee any specific delivery dates. Tracking will be automatically emailed to you as soon as it ships out. Feel free to contact us with any questions. 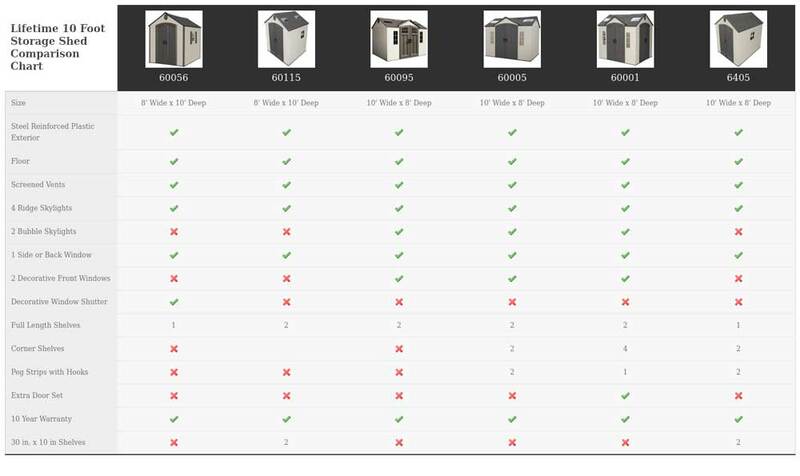 Q: I am interested in purchasing the Lifetime #60079 and Lifetime #60005 Storage sheds. They are going to be positioned side by side and I want to know if the colors are the exact same ? Roof colors ? side colors ? Door colors ? A: Yes, they are exactly the same. Most Lifetime Sheds are the same colors. Q: Will a motorcycle fit in this shed? A: It should fit just fine. It could depend if you have an unusually large motorcycle with side attachments etc., but the sizes are in the listing so you know what you're getting. Q: What are the exact colors of the shed, how are they different from earlier sheds? A: The walls are desert and (beige). The roof and doors are brown. Q: can my 8x10 shed be use for kids play house or for overnight sleep overs? A: I don't see why not; however, it is not insulated. 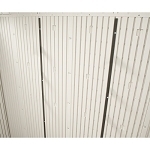 Q: How and what type of high wind tie down straps should be used for the 60005 shed? A: Unfortunately, we don't carry any hurricane or wind straps, but I'm told that your local hardware store is likely the best place to obtain those. Q: What kind of foundation do I build for the 60005 storage shed? A: Before beginning the assembly of your shed, you must pour or construct a platform. There are three types: concrete, wood frame, and road base in wooden frame or pea gravel filled into a wood frame. The actual dimensions of your shed, at its widest and longest points, are 96 inches by 100 inches. Please ensure that you select a site that will accommodate these measurements. The floor dimensions are slightly smaller than this; therefore, you will need to create a level surface that is 93 inches by 118 inches. These foundations create a level surface. If you assemble the shed on grass or on an unleveled surface you may run into issues during assembly with the doors closing properly. These foundations alleviate such concerns. Q: Do I need a building permit for my Lifetime shed? A: Building permits, codes, and regulations are handled by your city and state. We do not know if a specific town needs or does not need you to get a building permit. Please check with your city before ordering to make sure you comply with all requirements. A: Lifetime Products calls the color desert tan. Essentially, the panels of the shed are different shades of brown, with a slight grayish tint. The walls are the lightest complexion, followed by the doors, and then the roof. Q: What should I do if my shed shows up with damaged or missing parts? A: Please inspect the shipment at the time of delivery and note any damage with the driver before the driver leaves. After which, let us know via e-mail or by calling in. We will get whatever pieces are damaged replaced for you at no additional cost. 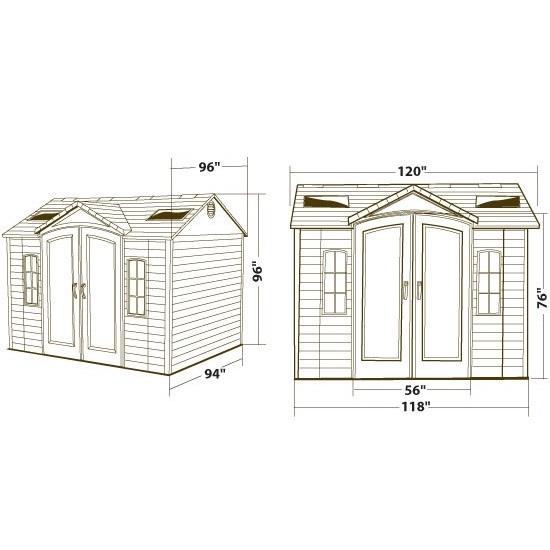 If your garden shed is missing parts, you can contact Lifetime Products customer service at 1-800-225-3865 and get the missing parts shipped to you at no additional cost. Q: How long does this shed take to assemble? A: Assembly times vary depending on the the amount of people assembling the shed and the ability of those working. Generally, if 2 people were working on this shed, assembly will likely take about 8 hours. Q: Do I need a foundation? A: The floor thickness of this shed is 3/4-inch. The floor is not a weight-bearing floor and will require some sort of support structure underneath. Typically, a cement slab or wood framework is used as the support. Q: Do have offer installation services? A: Yes we do, please call 855-544-8854 and give them the model number and your zip code and they should be able to give you a quote. A: Yes. The shed is delivered via a curbside delivery, which requires you to sign for the delivery. The Shipping Company will call you in advance in order to schedule an appointment for delivery. Also, the driver does not assist with moving the packages. Please take note of the package sizes and weights in the shipping tab to help you plan ahead to have sufficient help present to move the boxes where you need them on your property. Please note that Lifetime shed videos displayed on our website are produced for informational purposes only. For specifics of design and included features, please refer to the Overview and Specifications tabs for the product you are interested in purchasing. 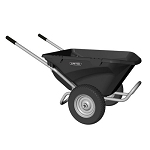 This product ships via an ltl carrier for a curbside delivery. This type of delivery requires the customer to be present to sign for the delivery and to move the boxes wherever needed on the delivery property. The driver will not assist with moving the packages on the property. Delivery appointments are scheduled by the delivery company before delivery is attempted. The breakdown of the package sizes are below. Box 1 is 95.31 inches L (242.087 cm) x 32 inches W (81.28 cm) x 15.375 inches H (39.053 cm), 326 lbs (147.871 kg). Box 2 is 95.31 inches L (242.087 cm) x 32 inches W (81.28 cm) x 12 inches H (30.48 cm), 186 lbs (84.368 kg). Dimensions: 96" x 32" x 32"